When cooked properly, eggs are always a safe, wholesome, and versatile food for you and your family to enjoy – in any recipe. Eggs are simple (one ingredient! ), all-natural and packed with many nutrients. One egg alone has 13 essential vitamins and minerals, high-quality protein and antioxidants – all in only 70 calories. Thoroughly clean your hands, as well as the surfaces and utensils that come into contact with raw eggs – an important step for avoiding cross-contamination. Keep eggs, in their original carton, in the main section of the refrigerator at a temperature between 33 and 40 degrees Fahrenheit. Make sure not to freeze eggs in the shell as their functionality will be compromised. You can however freeze eggs that have been cracked out using an ice cube tray. Eggs should be cooked until the whites and yolks are firm or, for dishes containing eggs, until an internal temperature of 160 degrees Fahrenheit is reached. Feel free to scramble up and microwave your eggs but never microwave eggs in their shell. Steam builds up too quickly inside and eggs are likely to explode. Check out the Microwave Cheese & Pepper Coffee Cup Scramble on our Recipes Page. Some of the most popular Google searches related to eggs are on the topic of “How to hard-boil an egg?” On one hand one of the simplest recipes, hard-boiled eggs can also be one of the hardest to perfect. When done right, a hard-boiled egg is a great complement to any meal or dish – from a quick light breakfast to the richest bowl of ramen for dinner. Follow these step-by-step instructions for hard-boiling an egg, and you’ll end up with perfectly boiled eggs, every time. PLACE eggs in saucepan large enough to hold them in single layer. ADD cold water to cover eggs by 1 inch. HEAT over high heat just to boiling. DRAIN immediately and serve warm. OR, cool completely under cold running water or in bowl of ice water, then REFRIGERATE. Banish the greenish ring. A harmless but unsightly discoloration sometimes forms around hard-boiled yolks. It is the result of a reaction between sulfur in the egg white and iron in the yolk. It occurs when eggs have been cooked for too long or at too high a temperature. Our method for banishing this ring from your eggs: cook your eggs in hot, not boiling, water, when they are finished cooking, cool them in cold water immediately. To peel a hard-boiled egg: Gently tap the egg on countertop until the shell is finely crackled all over. Then, roll the egg between your hands to loosen the shell. Finally, start peeling at the large end, holding the egg under cold running water to help ease the shell off. In the shell, hard-boiled eggs can be refrigerated safely for up to one week. Refrigerate them in their original carton to prevent any odor absorption. Once peeled, hard-boiled eggs should be eaten that day. Fact – It’s almost impossible to hard-cook eggs above 10,000 feet. Choose the right size pan: Select a heavy pan, preferable nonstick, with sloping sides, which make it easier to reach in with a wide spatula. For 1 egg, use a 6-inch pan; for 2 eggs, use an 8-inch pan; for 3 or 4 eggs, use a 10-inch pan. For more than 4 eggs, fry in batches. Use a small amount of cooking fat: 1 teaspoon of butter or oil for each egg is usually enough. You might prefer to fry eggs in butter, but when serving them with an olive oil-based garnish, use olive oil as the frying medium, to match the flavors. To reduce the saturated fat, you can fry with nonstick cooking spray, vegetable oil or a mixture of half vegetable oil and half butter. Heat the pan slowly: Typically, heat the pan over medium-low heat just enough so that you can feel the warmth (not searing heat!) of the pan when you hold your hand about 1 inch from its surface. Then add the butter or oil and reduce the heat to low. (If using cooking spray, coat the cold pan and then begin to heat.) Butter is hot enough when it begins to sizzle; oil is hot enough when a drop of egg or a bread crumb sizzles gently when added. Add the eggs carefully: Breaking an egg on the side of the pan and flopping it into a hot skillet can risk broken yolks, shell fragments and burned fingers. Do crack each egg into a small bowl or cup so you can remove any bits of eggshell or blood spots. (Use the tip of a knife or a teaspoon-sized piece of the broken shell.) Also, if the yolk breaks when placed in the cup, the egg can be saved for another purpose. Pour each egg from the cup into a clear spot in the hot pan. Fry the eggs over low to medium-low heat. Cook the eggs until the white begins to set, about 1 minute. For a very delicate white and a thick, creamy yolk, cover the pan and cook the eggs over low heat for about 5 minutes. Alternatively, cook the eggs entirely uncovered, adjusting the heat between medium and medium-low, for 4 to 5 minutes total time. This method produces a creamy yolk that is gently set on the bottom and a white that is lightly browned on the bottom. In this method of frying, the film of white that covers the yolk is set with direct heat. Cook the eggs as for sunny-side up, but flip each egg over during the last 15 to 20 seconds of cooking. The challenge here is to turn the egg over and then out of the pan without breaking the yolk in the process. It’s easiest to use a wide spatula. As in everything, practice makes perfect. This is the name for a method that lightly cooks the thin layer of white covering the yolk but doesn’t involve flipping. Fry the eggs following the procedure for sunny-side up, covering the pan after the whites are set. During the last 2 minutes of cooking, lift the lid and quickly sprinkle the eggs with 2 to 3 teaspoons of water. Immediately cover the pan and continue cooking. The steam will “baste” the eggs and set the film of white around the yolk. The first key to success when poaching eggs is to use the freshest eggs possible. A freshly laid egg has a thick viscous albumen and a rounded yolk, which will poach into a perfectly plump oval with the yolk sitting pertly on top. But as an egg ages, the white becomes thinner and the yolk flattens. When the egg is lowered into hot water–especially if it is boiling rapidly–the thinner portions of the white will disperse and cook into lacy, featherlike strands. Use only the freshest eggs for poaching perfection. Add a bit of vinegar and salt to the poaching water, which helps the whites to coagulate, and keep the water at a bare simmer, which also helps prevent feathering. If you are uncertain about the age of your eggs, be sure to read the tip below about “preboiling,” but you may want to try cooking them in a metal poacher, a mold or a coddler. Fill a deep 10-inch skillet or a sauté pan with water, adding 1 tablespoon white vinegar and 1 teaspoon salt for each 2 quarts of water. Heat the water to a bare simmer. Add the eggs in a clockwise pattern, so that you can remove them in the same order, ensuring equal cooking times. If using older eggs, you can give them a “preboil” in the shell before poaching to set the whites slightly and help control feathering. Bring the water to a boil and lower each egg (still in the shell) into the pan – immerse the eggs for only 8 seconds, then remove. 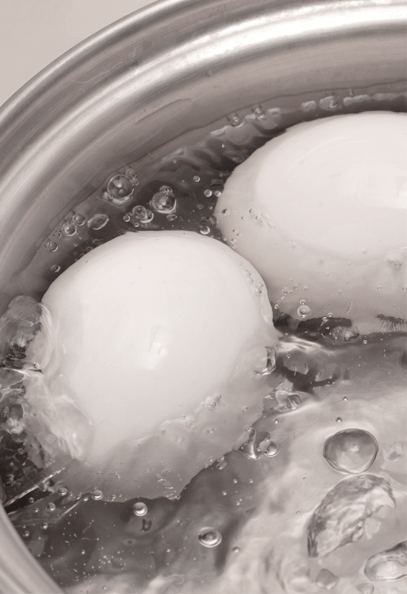 Reduce the heat, and proceed to crack each egg into a cup and slip it into the simmering water. Adjust the temperature as necessary to maintain the simmer, but do not allow the water to boil, as the turbulence would cause feathering and toughen the egg whites. Cook the eggs for 1 minute, until partially set, then gently loosen them from the bottom of the pan with a spatula. If necessary, gently shape the whites into ovals. Poach until the yolks and whites are cooked to the desired doneness, 3 to 5 minutes. Remove the eggs one at a time with a slotted spoon in the order that they went into the pan. Drain each egg by holding the spoon on a cloth towel or paper towels for 2 seconds, then slip it onto a plate. If necessary, trim any ragged edges of white with a small knife or scissors. To hold poached eggs for later use, slip them directly into a bowl half-filled with cold water when you remove them from poaching liquid. To reheat the eggs, carefully remove them from the water with a slotted spoon and lower them into a pan of very hot water for 1 minute before serving.continue cooking. The steam will “baste” the eggs and set the film of white around the yolk. We’ve gathered a few easy and delicious egg recipes just for you.